Where do you look for iPhone and iPad accessories? Your local Brookstone, Best Buy, the Apple Store or maybe even Kohl's There are lots of places to look, but one destination has become my go-to spot for accessory browsing: Kickstarter. The Amazon owned, crowd-funding site, which invites users to invest in various projects with small sum “pledges” that only have to be paid if a project reaches its funding goal, is a breath of fresh air for iDevice accessory shoppers like myself. Kickstarter projects associated with Apple hardware seem to be doing very well, both on the site and after achieving funding. Kickstarter is a breeding ground for not only iOS accessories, but for iOS software as well. One if the most understated advantages of the iOS devices has always been the that they have tons of accessories available them. Compare this to other devices that barely have cases or accessories available at all. Kickstarter has made the innovations of those, whom would normally not be able to bring their ideas to life, a place to not only introduce those ideas but to bring them to market. Here’s a look at some of the best iPhone, iPod and iPad-related projects Kickstarter has brought us so far. Apple’s iPod line has been overshadowed by the iPhone and iPad for quite some time now, but that didn’t stop the bite-sized music player it unveiled last fall from sparking the imaginations of many an accessory maker. Designer Scott Wilson was one of those who saw great potential in the 2010 iPod nano, and he came up with something that fits seamlessly with Apple’s own minimalist sensibilities. iPhone photography is not a new phenomenon, but it seems to be taking off as the quality of the device’s camera improves. But for all their enthusiasm, mobile photo buffs still run into the limitations inherent in using a smartphone camera. Stability and shooting in low-light situations definitely number among those weaknesses. The Glif, designed by Dan Provost and Tom Gerhardt, aimed to fix some of the problems with iPhone photography in a simple way. 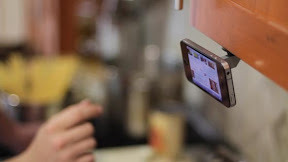 The Glif is a single piece of hard rubber with a metal threaded tripod mount that snugly grips your iPhone 4. 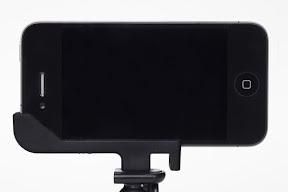 It works wonderfully, as I discovered, letting you use your iPhone with any standard tripod, and other useful photo accessories like the Joby GorillaPod. The Glif might have been possible without Kickstarter, Glif designer Provost says, but the site “does so much more than just money raising.” According to Provost, it also “creates and fosters an enthusiastic community around your product, which is invaluable.” The Glif retails for $20.00. Another project related to iPhone photography (they aren’t exactly a rarity), the GoPano micro also achieved Kickstarter success. It’s a case/attachment combo that allows the iPhone 4 to record 360-degree videos, which you can then upload and share to the GoPano website. This relatively small and inexpensive add-on for the iPhone is a classic Kickstart project: a product that appeals to such a relatively small niche of customers that it probably wouldn’t otherwise get made. But for realtors, nature lovers and others who might benefit from the tech, it’s an amazing device at a great price, and judging by the GoPano micro’s nearly $170,000 in funding, many agree. The GoPano micro will retail for around $80 when it becomes available. Holding the iPad for longer periods of time can be a bit of a challenge. Designer Bernie Graham recognized that, and created the PadPivot, which features a ball-and-socket design, combined with a contoured base to make it easier to perch your iPad on your thigh at an easy angle for viewing. In my review, I couldn’t really find anything bad to say about the finished product. Graham says that while he likely could’ve made the PadPivot a reality without Kickstarter, the site streamlines things and really allows entrepreneurs to focus on the process. And having watched along as the PadPivot made its way through funding, to production, to being retail-ready, you really see the advantage of Kickstarter from a small manufacturer’s perspective, as well as the challenges that ramping up to full-scale production present. 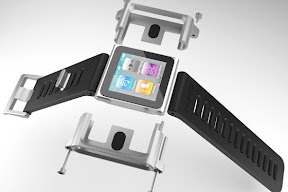 The PadPivot will retail for around $25 when it becomes available. Dan Provost and Tom Gerhardt had so much fun creating the Glif on Kickstarter that they went back for seconds. 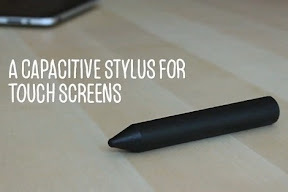 The Cosmonaut, another project to break $100,000 in funding, is an iPad stylus designed based on how users actually draw on their iPads. The project was unusual in that it started out with a risky “pay what you wish” option, where every backer who pledged at least $1 would receive a pre-order of the finished product. Luckily, the gambit seems to have worked out in Provost and Gerhardt’s favor, as you can tell by the success of the initial funding. It also reflects well on the Kickstarter community that it rewards smart design, even when given leeway to take advantage. The Cosmonaut will retail for $25 when it becomes available. 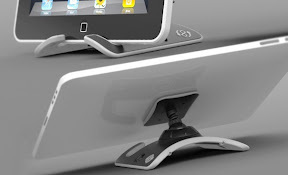 Looking for a flexible iPhone mount that can stick to a variety of surfaces? The Oona can do that, and more. It works as an in-car windshield mount, a desk stand, a tripod attachment and even an under-the-cupboard clip for browsing recipes. Like the other projects listed here, it’s also stylish, showing off considerable design talent from the team of Brad Leong, Danny Fukuba and Sam Gordon. The Oona managed to exceed its funding goal by more than $120,000, and is now accepting pre-orders with a four- to eight-week lead time. The Oona retails for $25.00 now in pre-orders, and $29.95 once it becomes widely available. The last project on this list, Thomas Lehman’s MySaver, has yet to be fully funded. But the problem it addresses is so widespread that I have faith it’ll exceed its goal. 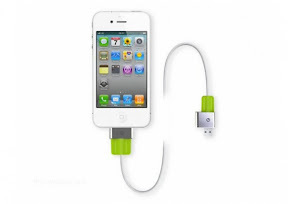 The MySaver addresses the tendency of iPhone, iPod and iPad cables to wear out near the points where they connect to the USB or dock connector ends. This has eventually happened to nearly all of my iPhone USB cables. The MySaver comes in two flavors: a DIY version for upgrading your own cables at home, and a Pro version that comes pre-assembled with a high-quality OEM dock connector to USB cable of its own. The project is a smart idea, solves a common problem, and something we haven’t yet seen from the usual crowd of established accessory makers. The MySaver can be pre-ordered with a $8 Kickstarter pledge for the DIY version, or a $19 pledge for the Pro version. That’s just a sampling of some of the best and brightest Kickstarter has to offer. There are tons there; just search for iPad or iPhone once you visit Kickstarter.com and enjoy the options available. It is very exciting to be involved with helping these products come to market. Got any other suggestions we missed? Share them in the comments. We wanted to get in touch and let you know about our project "cellhelmet," which was just funded on Kickstarter.com. It is the first and only case to guarantee the iPhone 4/4S inside, for US & Canadian residents. If your iPhone should ever break inside of a cellhelmet, we'll repair or replace it - guaranteed. Please read on via the following link and get in touch with us. We'd love to get your support and give you all the details!